Looking for some heavy riffs to tide you over for the remainder of the workweek? 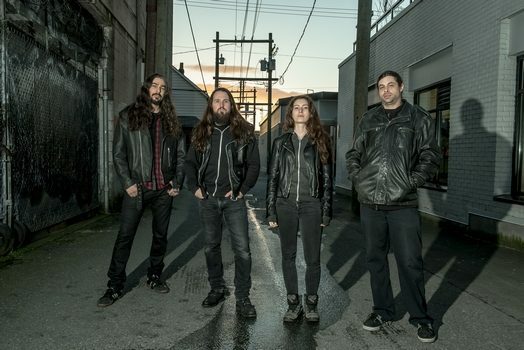 We at Dead Rhetoric have been tasked with premiering the video for Vancouver death/thrash act Revenger’s “Hex.” The song comes off of their upcoming release, The New Mythology Vol. 1, which is set for release on February 17, 2018. If you like what you hear, you can pre-order the EP HERE or click on the Bandcamp widget below, where you can also check out two other tracks available for streaming. Of the track, you can expect a seamless combination of thrashy and frantic riffing, coinciding with plenty of blasts and brutal vocals. A solid knack for groove accompanies their technical-flavored material, with a stellar solo to make sure all the bases have been covered. As the opening track, “Hex” does a good job of setting the stage of what’s to come over the course of the EP. A strong sense of urgency sits in the music, and while there’s plenty of visceral energy to feed off of, the underlying melodious tones enrich the experience and give it some added legs for repeat listens. 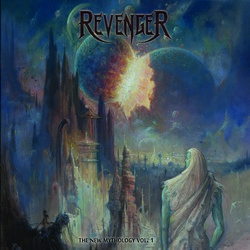 The New Mythology Vol.1, Revenger’s second studio release, is a 5 song EP that expands on the band’s aggressive thrash form with tracks that are more technical, visceral and direct than their first album To The Wolves. Formed in 2012, the band introduces some key members that shape the sound and vibe of this EP into a collection that is more calculated and driven than before. Heavy guitar rhythms punctuated by a consistent thrash pulse breaks only when the groove requires and marks Revenger’s particular style. The lyrics and gritty death vocals also bring out the rage and bitterness of the subject matter which, for this EP, is slightly more conceptual and inspired by comic books and how today’s mythology could become tomorrow’s dogma. I think the particular style that we are creating is pretty exciting. It’s straight up thrash that can get catchy sometimes or more death metal other times but over all it’s pretty straight forward, but that’s where I find the freedom in it. We can be unpredictable and come up with two riffs that don’t seem to go together at first but somehow work and then lead back into something more traditional. We play the music we grew up listening to but with our own filter on it. We don’t try to sound like anyone but our influences definitely come out. Bringing this EP to as many people as we can is something that is getting me really excited and I’m super stoked for this next year. A lot of hard work has gone into this as with any musical project and it’s incredible to bring it into reality.